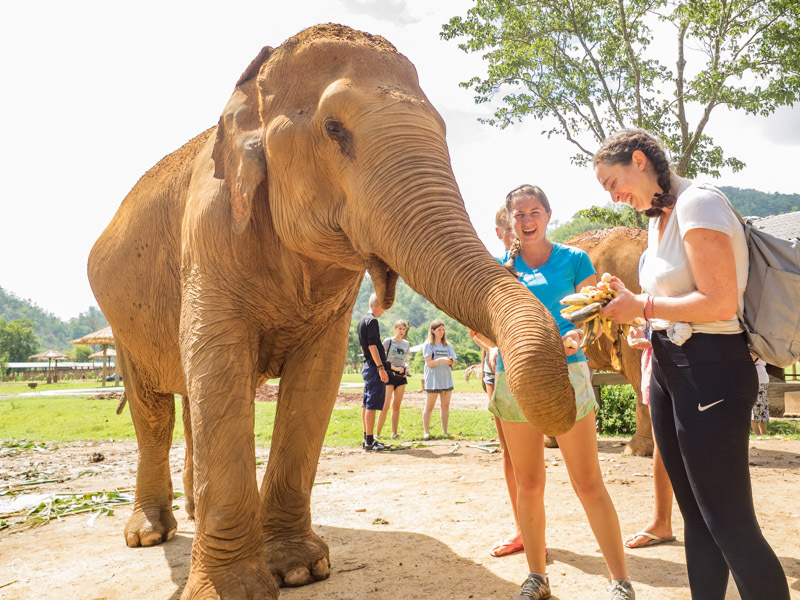 Elephant Nature Park’s weekly volunteer program is the highlight of many travelers’ trips to Thailand. Honestly, I can say without a doubt that volunteering at Elephant Nature Park was not just the highlight of my trip to Thailand, but my entire year of travels. People can sometimes make lofty claims on their website, but when Elephant Nature Park says that at the end of the week “many people want to stay forever” I can attest that this was 100% accurate for most of us. I honestly regretted pre-booking my return flight home as it meant I wasn’t able to extend my stay at Elephant Nature Park for another week. 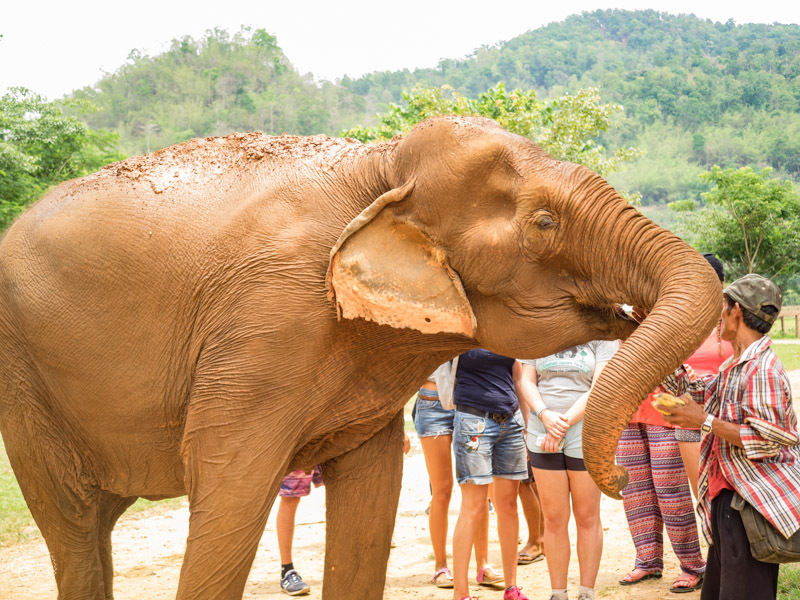 If you’re looking to volunteer with elephants at a reputable sanctuary where you can learn how to care for rescued elephants and have tons of fun in the process, you will absolutely love the weekly volunteer program at Elephant Nature Park. Elephant Nature Park was the first to create a new form of elephant tourism. One where tourists can come to learn about and observe elephants in their natural habitat. A place where they can participate in elephant care without forcing the elephants to carry them through the jungle or perform tricks. At Elephant Nature Park there is no riding, jungle trekking, performing, or bathing of the elephants. What you get here is the opportunity to walk around and get up close and personal with all the elephants in the park. You’ll learn about their history and how they came to live at Elephant Nature Park. You also get to hand feed some of the elephants bananas and watermelons, and, of course, take as many photos of these beautiful animals as you want. Elephant Nature Park is, first and foremost, a rescue and retirement center for working elephants. Most of the elephants who now call the park home were abused during their working life, and many arrive at the park with severe physical and mental injuries. This elephant’s leg was permanently disfigured after an accident. Some common conditions seen in new arrivals include blindness, dislocated limbs, emaciation, and aggressive or anti-social behavior towards other elephants. Elephant Nature Park has an on-site veterinary clinic as well as a vet and a team of nurses staffed at the park to treat new arrivals as well as longtime residents with chronic injuries. But it’s not just elephants who receive a new home at Elephant Nature Park. 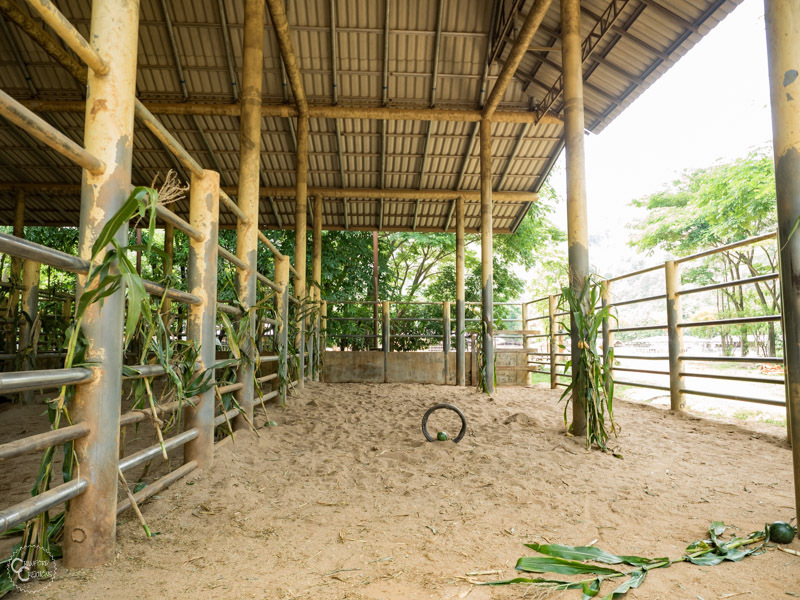 The park is also home to 400 dogs, 100 cats, and 100 water buffalo, as well as a few horses, monkeys, and even birds, all of whom were rescued by park owners Lek and Darrick. Elephant Nature Park does more than just rescue animals. The park actively works to spread awareness of elephant abuse by educating tourists and locals. 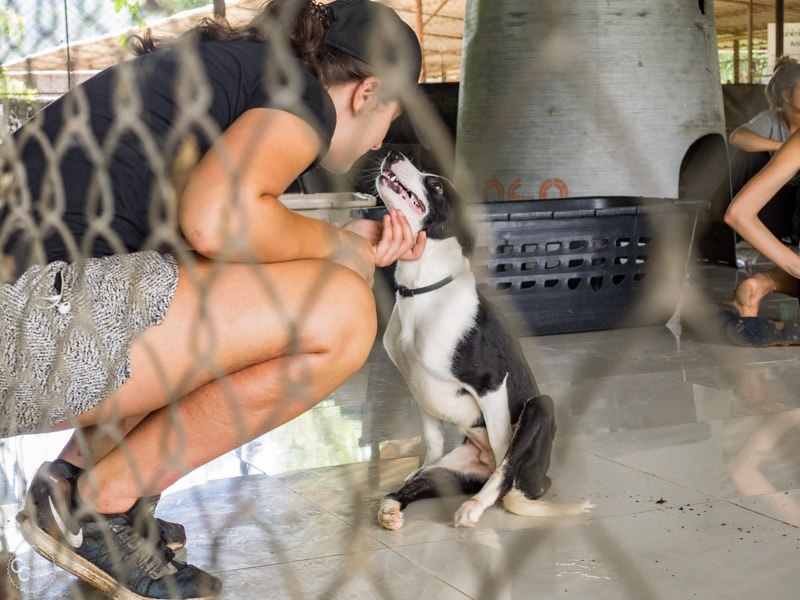 They work with the Thai government to improve legislation around animal welfare. They help to boost the local economy by hiring only local Thai employees, especially those from rural villages. And they are actively working to preserve the environment by planting trees in the surrounding area with the aim of reintroducing rainforest to areas that were previously destroyed by the logging industry. Why Should You Choose Elephant Nature Park Over Other Elephant Sanctuaries? 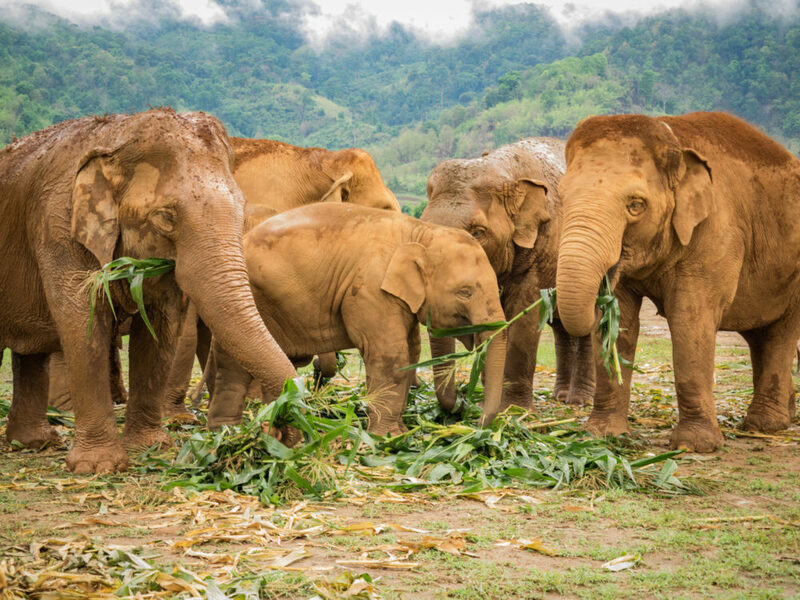 While Elephant Nature Park was the first of its kind when it comes to rescuing abused and retired working elephants and redefining elephant tourism, following their massive success, many other elephant parks in Thailand have followed suit. Ethical elephant tourism has exploded in Thailand as tourists realize the negative impact of riding elephants and park owners see the benefits of taking off the saddle. With so many parks to choose from, why should you come to Elephant Nature Park instead of one of the many other parks located throughout Thailand? Because nobody gives you a better experience than Elephant Nature Park. Elephant Nature Park is committed, not only to rescuing and protecting elephants but also to making sure that each and every visitor to the park has an amazing time. Their guides are incredibly well trained and speak fluent English so you know all of your questions will be understood and answered. 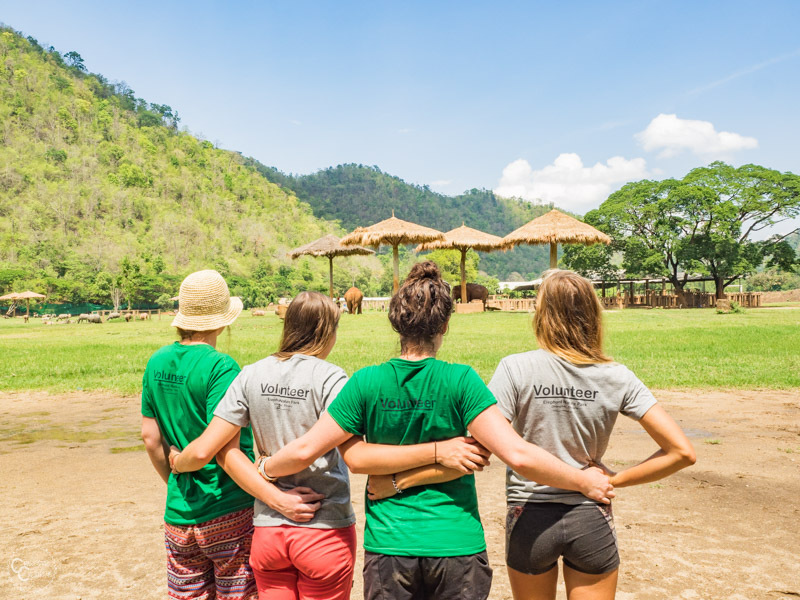 The guides also do an incredible job of making the experience fun, even while scooping up mounds of elephant poo or unloading what seems like a never-ending truck full of bananas. Their sense of humor truly made my time at the park such a blast. The food at Elephant Nature Park was amazing, and that’s saying something because I’m no vegan, but all of the food served at the park was. Any visitor to the park, whether you’re here for the day, or volunteering for the week, will get to taste their incredible vegan buffet of Thai food. At Elephant Nature Park, the needs of the animals always come first. 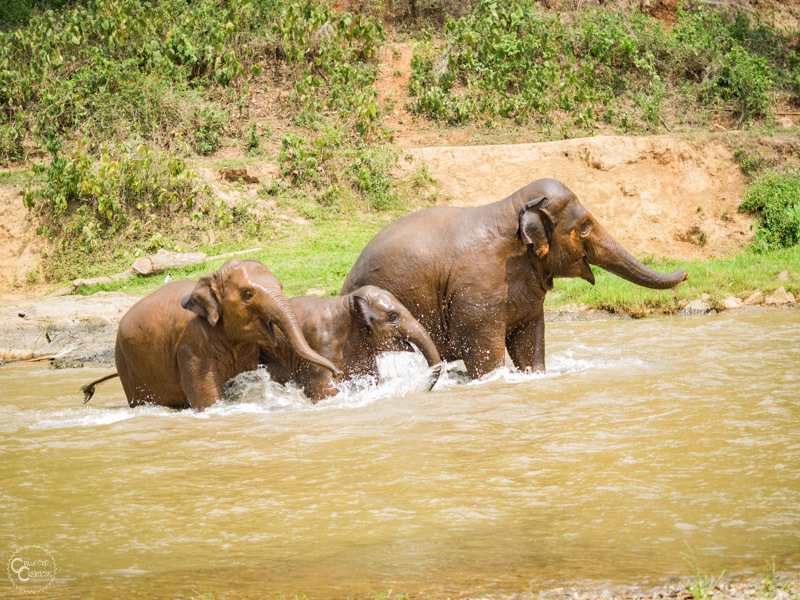 The elephants here have worked backbreaking hours at the demands of humans for years before finding a home at Elephant Nature Park, and the staff now makes sure that their elephants don’t have to do anything they don’t want to, including bathing in the river. This is their chance to finally be free. At Elephant Nature Park, the joy is in letting elephants remember what it is to be free elephants again. Finally, you simply can’t beat the variety of programs offered by Elephant Nature Park. Volunteering or visiting the park are just two of an enormous selection of experiences to choose from. Elephant Nature Park has a ton of outreach programs located in the rural villages of northern Thailand. If you’re looking to see elephants in a more wild and intimate setting, check out one of their many Saddle Off programs on their website. 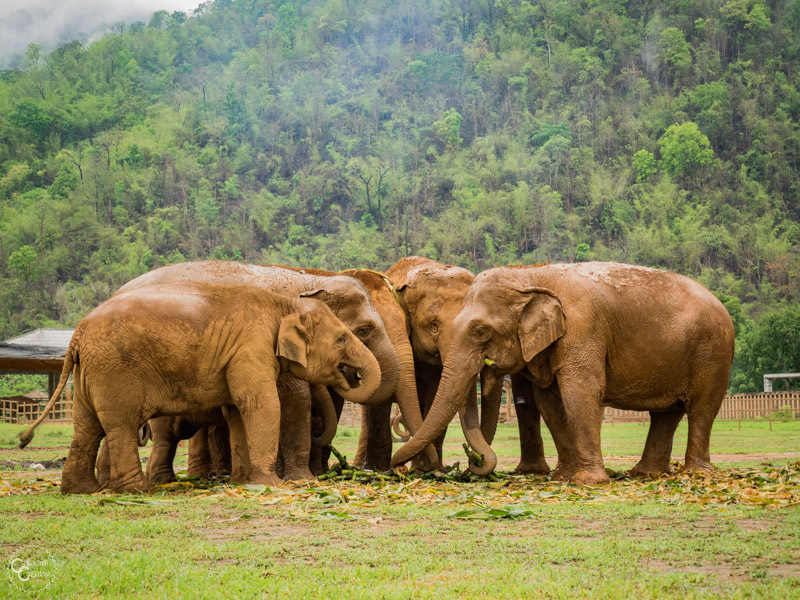 Elephant Nature Park also works with other elephant parks throughout Thailand who are looking to do away with riding and helps them transform their business into a similar elephant sanctuary. They help other elephant parks through their transition, and will even promote up and coming elephant sanctuaries on their website. All visits to Elephant Nature Park must be booked ahead of time. Booking is super easy and is all done through an online form on the Elephant Nature Park website, www.elephantnaturepark.org. As Elephant Nature Park is the most popular elephant sanctuary in Thailand, they book up fast, so if you’re limited on dates, make sure to book your spot well in advance. When I went to book my volunteer experience spots were fully booked two months in advance. A deposit is required to hold your spot. They also ask for your hotel information in Chiang Mai so they can coordinate pick up to bring you to the park. But don’t worry, you don’t have to book your hotel that far in advance. Simply leave that field blank and send them an email later with the address of your hotel. Staff from Elephant Nature Park will pick you up in a van at your hotel around 8 am the morning of your scheduled visit. You’ll then drive around and pick up the other tourists in your group, filling up the van, before driving an hour outside of Chiang Mai to the park. Travel insurance is required to volunteer at the park, but honestly, nobody checked when I went so don’t freak out if you don’t have it. It seems to be more of a suggestion than a hard and fast rule. Also, the staff at Elephant Nature Park are great about responding to emails. If you have any questions or concerns about your visit before you come, feel free to email them and they’ll get back to you right away. All volunteer experiences start on Monday and end on Sunday. Every day started off with breakfast at 7, followed by work from 8-10, break from 10-11:30, lunch from 11:30 – 12:30, work from 1-3, free time from 3-6, and then dinner at 6 pm. I had an absolutely incredible week volunteering at Elephant Nature Park. As a rule, I try to go into any new experience with no expectations, but honestly, my time volunteering at Elephant Nature Park was 10x better than anything I could have ever expected. Over and over again my guides and the owners, Lek and Darrick, who we got to personally meet, stressed that we are still on vacation and should be having fun at all times. Sometimes, as a volunteer, it can be easy to get taken advantage of and end up working from dawn till dusk, but at Elephant Nature Park it was completely the opposite. I almost felt like we were given too much free time and not enough work. Luckily for those of you, like me, who end up liking the work and want to do more, we always had the opportunity to fill up our schedules helping out around the park. The staff needed the most help in the dog kennel, so I spent most of my break time walking and socializing dogs that were up for adoption. I really appreciated that they gave the elephant volunteers fun chores when we came to help with the dogs, rather than having us do more dirty work. For those who don’t know, Elephant Nature Park also has a weekly volunteer program working with the hundreds of rescue dogs living at the park. I learned from hanging out with some of the dog volunteers that the dog program is much more hands-on than the elephant program. Understandably so as dogs require a lot less training and knowledge to work with than elephants. So, if you’re someone who enjoys hands-on work with animals you might want to consider participating in the dog volunteer program as well as the elephant program as the elephant program is much more hands-off than working with the dogs. If you’re an elephant lover like I am who also loves working hands-on with animals, I found that volunteering with elephants and supplementing that by helping out with the dogs on my breaks to be the perfect combo. There are always a lot more dogs than elephants at the park, and a lot fewer dog volunteers than elephant volunteers so the kennel is always in need of help. In addition to helping take care of the elephants and dogs, I spent the rest of my time getting to know my fellow volunteers, a few of whom became good friends by the end of the week. The cool thing about volunteering at Elephant Nature Park is that everyone who volunteers here does so, among other reasons, because they love elephants and want to help care for them and learn more about them. Starting from common ground means you’re bound to find at least a few people in your group with whom you really connect with. It was such an amazing feeling to start the week as one among strangers and leave with a group of friends. As there’s a lot of free time when volunteering at Elephant Nature Park, I was able to spend some evenings working on the computer. Wifi is available at the park, but it’s spotty and often loses connection. 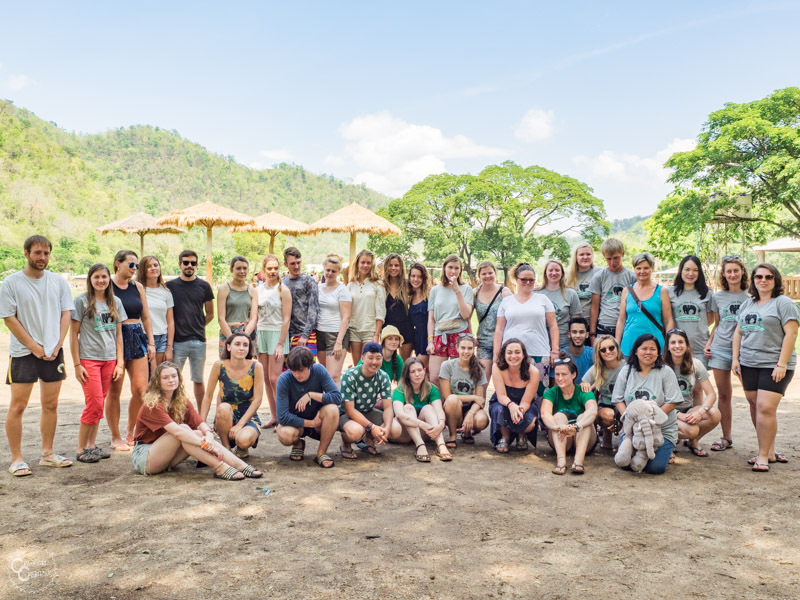 Volunteering at Elephant Nature Park is a great opportunity to disconnect and take a digital detox, but if you need to stay connected you can always buy a local sim card in Chiang Mai before you come. Those who had one had access to data and service for the entirety of their stay. Staff from Elephant Nature Park came to pick me up at my hostel in Chiang Mai at 8 am Monday morning. After spending about half an hour picking up the remaining volunteers (I was only the second person in the van) we drove 1 hour outside of the city to Elephant Nature Park. Upon arriving at the park, we met up with the rest of the weekly volunteers (there were 40 of us in total but during peak season there can be up to 80) and spent about an hour getting checked in. This entailed handing the staff a copy of our passports, filling out paperwork, and receiving our free t-shirts and water bottles. After checking in we met our guides, who split us into 3 groups, A, B, and C. We were then assigned to dorm rooms with other 2-3 other members of our newly divided group. After a few minutes of putting my stuff down in the room and meeting my roommates, we all piled back in the vans to head to our lunch spot. Lunch for the weekly volunteers is served at an offsite location just down the road from Elephant Nature Park. This is to avoid the massive crowds of day trippers that eat in the main pavilion. Lunch was delicious and consisted of a salad bar, multiple types of Thai curry, multiple stir fry dishes, rice, French fries, and fruit. All meals at the park are served buffet style and there was always more than enough food for everyone to take as much as they wanted of whatever dish they chose. After lunch, we had a meeting where the guides broke down our chore schedule and explained what we’d be doing for the rest of the week. Our chores were divided into morning and afternoon duties, all rotated evenly between our three groups and included cleaning the elephant enclosures, preparing elephant food/feeding the elephants, cleaning up the park, cleaning/refilling water tanks, going on elephant walks, and elephant enrichment. Today was basically a free day in terms of work as after orientation we had the rest of the afternoon to relax and get settled in before dinner at 6. Every night after dinner the staff organizes what is usually an optional activity for the volunteers in the main pavilion. Tonight’s activity was the only one that was mandatory, and for good reason. The shaman from one of the local villages came to perform a blessing, a traditional Buddhist ritual in which a shaman or monk bestows upon people well wishes of peace, happiness, prosperity, and good health. The shaman performed a group ceremony for everyone, after which his disciples came around to bless each and every one of us individually. As a symbol of the blessing ceremony, he tied a woven bracelet around each of our wrists. The thread is meant to connect the good karma from prayer to everyone in the room. Tuesday was our first full day of work. After eating breakfast at 7 we met our guides just before 8 am to start work. My group was assigned to clean the elephant enclosures this morning along with one of the other groups. The founder of Elephant Nature Park, Lek, is the first to admit that Elephant Nature Park is not a perfect sanctuary. The elephants here are allowed to freely roam the park during the day but are kept in large enclosures at night. The reason for this is that Elephant Nature Park doesn’t own enough land at their main facility to allow all the elephants to roam freely without human supervision. In total, Elephant Nature Park sits on just 40 acres of land and is home to upwards of 40 elephants, not all of whom get along with each other. Elephants roam in matriarchal family groups of 6-12 elephants and typically do not interact with other families. Allowing 10-15 family groups the opportunity to roam free on such limited land without conflict with other elephant groups is an around the clock task, and one that Elephant Nature Park is not equipped to provide. Elephant Nature Park is also surrounded by farms and other elephant parks that would not be happy to have a rogue elephant come tramping through their land destroying crops or getting into fights with other elephants as there is no fence around the property. Keeping the elephants in large fenced in enclosures at night allows the mahouts to have a break and get a full night’s sleep without having to worry about the safety of their elephants. So, for now, the elephants must adhere to the schedule of roaming free during the day and being fenced in at night. Of course, Elephant Nature Park is always trying to improve. 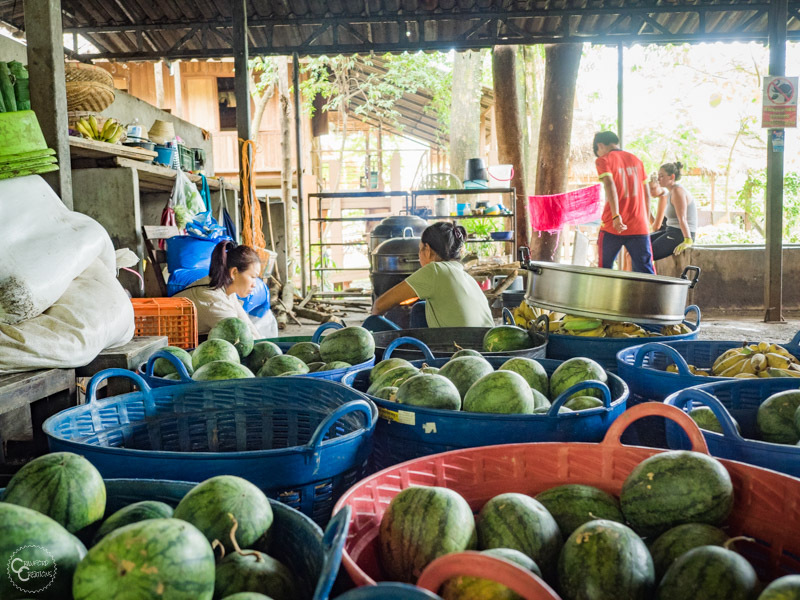 As expanding their main location in Chiang Mai is currently impossible, they are working on moving some of the healthy, self-sufficient, family groups to a new, much larger location where they can roam free 24/7 with limited human supervision. Any time you have animals in an enclosed space, that space inevitably needs to be cleaned. And that’s where the volunteers come in. While scooping elephant poo is not the most glamorous of jobs, our guides made the process as fun as possible, playing music while we worked. After 2 hours we had cleaned all of the enclosures and took a break before lunch. During the break, a bunch of the volunteers and I met up with the head of the dog volunteer program to help socialize some of the dogs before lunch. A handful of us each got assigned to a specific run full of dogs. Our job was to interact with the dogs and give them as much attention as possible. It was certainly more fun than work and we were all more than happy to love on some dogs for an hour. Helping out with the dogs is completely voluntary, but I found it a great way to fill up some of the abundant free time in our schedule. After loving on the pups it was time for lunch at 11:30, and then back to work at 1 pm. My group’s job this afternoon was to clean the park. This entailed walking around the park and picking up all of the leftover corn husks and poo left behind by the elephants. While this job is a bit more physically demanding it’s also more fun as you get to be out in the park working alongside the elephants. Work ended at 3 and then we were more or less done for the day. While all of our required work ended at 3, there was always an option to walk dogs or go on an elephant walk and hang out with the mahouts in the field. Dinner was in the pavilion at 6 and again consisted of a massive buffet of vegan Thai dishes. The optional activity tonight was a movie. As with every day, chores started at 8 am where my group’s job was, once again, to clean the elephant enclosures. By 10 we were done and some groupmates and I went off to socialize some more dogs. This time we worked with a group of dogs that were paralyzed in their hind legs, an all too common result of being hit by a car. Most of the dogs rescued by Elephant Nature Park come from Bangkok, where stray dogs run rampant. All of the dogs here are up for adoption, so socialization is incredibly important when it comes to finding them a new home. After our lunch break, we met back up with our guides to start afternoon chores at 1. Our group had a special treat today as the co-owner of Elephant Nature Park, Darrick came out to take us for a personalized walk around the park. 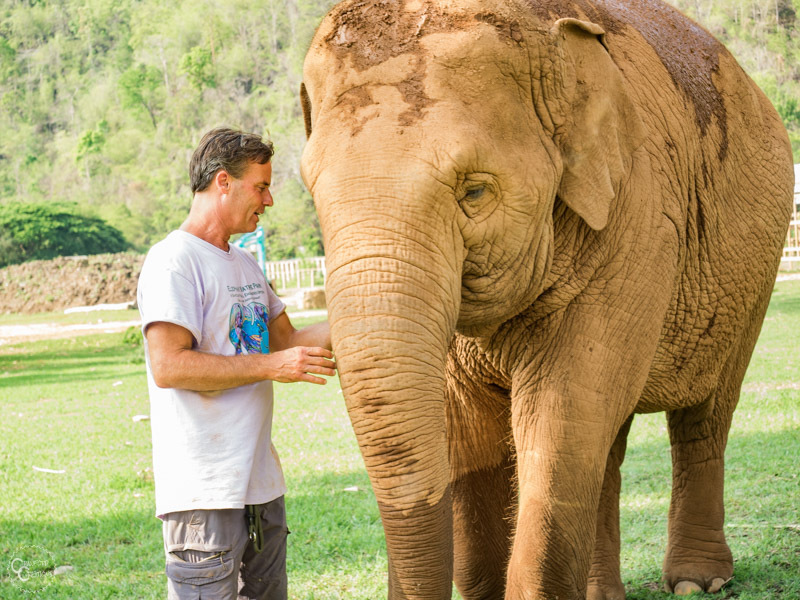 Darrick runs the day to day operations of Elephant Nature Park, and, as such, is intimately familiar with every facet of the goings on at the park. Darrick took us around to each elephant family in the park and told us every elephant’s unique story. He shared about their personality, history, and current situation at Elephant Nature Park. 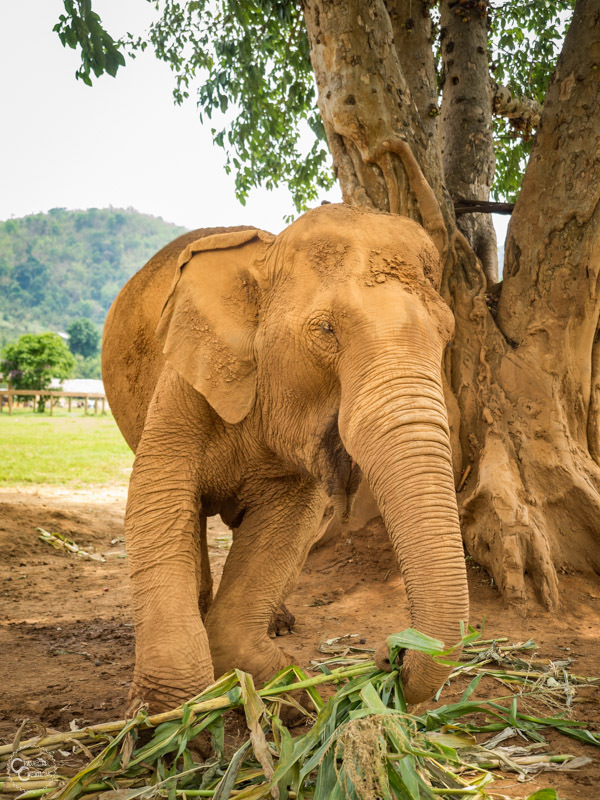 We learned that most of the elephants at the park were rescued from the logging and riding industries and came to Elephant Nature Park only after enduring horrific injuries in which Lek could make a case for rescuing the elephant and retiring he/she from work. As it turns out, rescuing an elephant is nothing like rescuing a dog or a cat. When rescuing most animals, people freely give you their animals in exchange for your efforts caring for and rehabilitating them back to health. But that’s not the case with elephants. Elephant Nature Park basically has to beg an elephant owner for the opportunity to purchase their injured elephant from them. And elephants don’t come cheap. The elephant owners depend on their elephants for their livelihood so, in order for them to justify selling one, they have to be able to recoup their costs enough to either buy another elephant or have enough money to live on from the sale of their elephant alone. Elephant Nature Park pays thousands of dollars to rescue just one elephant. And that doesn’t include the cost to transport the elephant to the park or pay for any necessary veterinary treatment. Sometimes, an elephant owner is unwilling to sell their old or injured elephant, even when they are in obvious need of retirement or medical help. Other times, the price to purchase an elephant is simply too high and Elephant Nature Park can’t afford to help. The result of both cases is that these old/injured elephants are forced to continue working at the hands of their owners and mahouts. The sad truth is that they will never get the help they deserve and will most likely die on the job. It’s a harsh reality, but one that both the staff at Elephant Nature Park and the voices of the tourists that visit the park are working to change. The stories Darrick told us about many of the elephants at Elephant Nature Park were heartbreaking. Stories of elephants blinded by their mahouts for making a mistake, acting up, or refusing to work. Stories of elephants shackled and forcibly bred by angry bulls resulting in gruesome joint dislocations for which there is no cure. Stories of elephants trapped in snares by poachers. The list goes on. Remarkably, most of these stories have a happy ending. The majority of the elephants rescued by Elephant Nature Park have recovered from their injuries and are now living a happy, healthy life at the park. 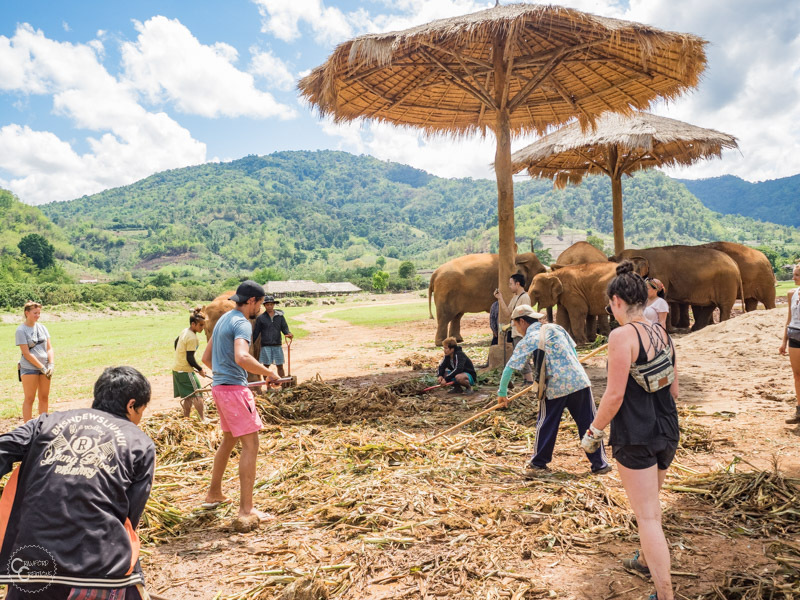 The elephants at Elephant Nature Park are cared for around the clock by loving mahouts, staff, and volunteers who now work for the elephants instead of the other way around. It was fascinating to listen to Darrick introduce us to each and every elephant at the park and share their stories with us. It was also amazing to see the bond that he has with most of the elephants here. Many of the elephants would follow him around, play with him, or come to protect him like a mother would her calf. It was really endearing to see both their love for him and his passion for helping them. Of course, not all of the elephants adjusted seamlessly to their new life. We walked by a couple of elephants that were kept in large enclosures, separated from the rest of the elephants and tourists in the park. These were the aggressive elephants who haven’t let go of their anger from being mistreated. The hope is that, over time, these elephants will start to let go of the past and become more receptive, first to the friendship of other elephants, and then to people. Following our walk, we ate dinner at 6 and then had the optional activity of participating in a Thai language and culture lesson where our guides taught us some basic Thai phrases and social norms. Today was our first day relieved of elephant poo cleaning duty and onto feeding duty, the highlight of volunteer work at Elephant Nature Park. We started the morning by helping the staff prepare some of the elephants’ food. My friends and I sat peeling over-ripe bananas for use in the elephants’ rice balls. Once the bananas were done we moved on to unloading a giant truck full of watermelons. Our group formed an assembly line and passed watermelons down the line ending in a giant pile on the floor of the kitchen area where staff would then cut them into chunks for the day visitors and mahouts to feed to the elephants. After about an hour and half of work, the hard work was over and it was on to the fun part, actually feeding the elephants. Our guide instructed each of us to grab a bunch of bananas and we walked out into the park to meet the two elephants we would be hand feeding this morning. We each took turns handing the elephants bananas and laughing as the picky elephants tossed the unwanted bananas on the ground, only eating the ones that had ripened to their liking. At one point we were literally belly laughing at the ridiculousness of it. But hey, when you’re 70+ years old and get fed bananas by tourists day in and day out I guess you can afford to be picky. Work started back up at 1, where our job was to clean the elephants’ water tanks. This was a welcome job to being doing in the heat of the day as we each got splashed with cool water as we dumped and scrubbed the tanks. My friends and I also got an unexpected elephant encounter when cleaning one of the tanks in the middle of the park. A curious elephant came looking for water and found us inside of her tank instead. She started tapping us with her trunk wondering what the heck we were doing prompting us to once again burst out laughing. Work is all in good fun at Elephant Nature Park. Before dinner at 6, we got a special treat. Lek, the founder of Elephant Nature Park, arranged a Q&A session for us. She spent an hour with us telling us her story and answering all our questions. After dinner, our optional activity was listening to the mahout band perform. This was nothing like I thought it would be. It was less rock band and more school band concert, except way more impressive as the mahouts handmade all of their instruments. They made drums out of barrels, and flutes out of old PVC pipes. It was truly amazing. Socializing the dogs at Elephant Nature Park. This morning it was back to cleaning the elephant enclosures before breaking for some more dog socialization. All of the dogs up for adoption at Elephant Nature Park are kept in large outdoor runs with an overhanging shelter. Each run houses up to 10 dogs, which allows the dogs to naturally become socialized with each other. The runs are plenty big enough for the dogs to run around and play with each other, but volunteers like us are needed to teach the dogs how to play with humans. Most of the dogs are super sweet and light up when we come in to play and love on them, but there are a few shy ones as well who we have to coax out of their hiding spots. After lunch, our afternoon job was elephant enrichment. Elephant enrichment is one of the efforts Elephant Nature Park is taking to help transition one of their healthy family groups to life at their new larger location. Our job was to take corn husks, watermelons, and bananas, and place them randomly around the elephant enclosures. The hope is that this will accustom the elephants to walking around and searching for food, as they have to do in the wild. As it stands, the elephants are used to getting fed in the same spot day in and day out. But that’s not how it works in the wild, or how it will work in their new location. The goal is that this new, much larger piece of land acquired by Elephant Nature Park will function as a transition area for the elephants to relearn their survival skills in a safe environment. Looking into the future, owners Lek and Darrick hope to ultimately be able to release some of their elephants back into the wild. The optional activity tonight was again a movie, which I skipped in favor of a Thai massage. You could actually get a Thai massage every night if you wanted to. Every night masseuses from the local village set up their mats and chairs on the upper level of the pavilion and offer foot and full body massages for 80 and 100 baht respectively ($2.50 or $3.20 US dollars). When getting a massage at Elephant Nature Park your money goes directly to the local masseuses. By getting a massage at the park, you’re not only rewarding your body after a week of hard work but are also supporting the local village women, most of whom are single mothers working to support their family. Our group of weekly volunteers. Today was our last full day of work, which meant it was our last day of cleaning the elephant enclosures. I know this was a joyful ending for some, but I really enjoyed all the work we did and would have been happy to help scoop elephant poo every day if that’s what they needed. Call me crazy, but I guess I’m just used to it after all my years working with horses. As some of the volunteers in our group had to leave this afternoon to catch their flights out of Thailand, our guides scheduled a group photo session for us after lunch. We used what would usually be our dog socializing time to shower and clean up for our photo. Everyone handed over their cameras for the guides to snap photos with. They took big group photos as well as photos of small groups who’d become close friends over the course of the week. We then spent the rest of the afternoon cleaning up the park and walking around with the elephants before dinner. As tonight was our last night at the park, they served a special barbecue dinner complete with entertainment by the local village women. The entertainment was in the form of a traditional Thai dance. I’d say our group lucked out with our schedule as we got to spend our last morning at the park preparing food and feeding the elephants instead of cleaning. I can’t think of a better last work shift than hand feeding an elephant. I know this was only my second time doing it, but somehow, I don’t think hand feeding an elephant would ever get old. After feeding it was time for one last buffet lunch before showering and packing our things to leave. My week at the park was so fun and relaxing I honestly didn’t want to leave and regretted not booking my experience for 2 weeks. Something I wish I knew ahead of time, was that anyone who does volunteer for more than 1 week gets to spend their second week helping out in the vet clinic doing a lot more hands-on work with the elephants. It’s their way of saying thank you for staying longer, and making sure they keep all the volunteers engaged and learning as much as possible during their time at Elephant Nature Park. After lunch, it was time to shower and pack our things. We wrote on a whiteboard our name and the name of our hostel or destination in Chiang Mai earlier that week so that our guides could coordinate drop off back in Chiang Mai. Most people got dropped off at a hostel in the city, but you could also ask to get dropped off at the bus station or airport if you’re planning on leaving Chiang Mai that day. Vans left promptly at 2:00 pm to take us back to Chiang Mai. Your accommodations are in the form of dorm rooms at the park that sleep anywhere from 3-5 people. There are no bunk beds, so you don’t have to worry about fighting for who gets the bottom. All the rooms come with mosquito netting around the beds and fans, but no a/c. Rooms are arranged motel style with each room having access to the outside. Most of the rooms have ensuite bathrooms with the exception of just a couple of the bigger rooms that have a bathroom next door. All bathrooms have seated toilets and hot water showers. There is no wifi in the rooms, so if you want to use the internet in the evenings you have to stay inside the pavilion/dining area. Our guides stressed to us numerous times to let them know if there is anything wrong with the rooms i.e. something is broken or not working and they would send somebody to fix it asap. I can attest that the maintenance crew at Elephant Nature Park is on top of it as they came and fixed our broken hot water heater right away, no problem. Accommodations for the weekly volunteers at Elephant Nature Park are basic but otherwise clean and perfectly comfortable. If you’re looking for a bit more luxury accommodations, an overnight stay might be more your speed, as the overnight guests stay in much nicer digs complete with air conditioning. That being said, our volunteer rooms suited my needs just fine. Elephant Nature Park serves all vegan food, but don’t let this scare you. They are known for their delicious lunch and dinner buffets, and delicious they are. Thai food is particularly amenable to being cooked vegan so eating vegan curries and stir-frys was honestly not too much different from eating regular Thai dishes. Breakfast consists of toast, cereal, fruit, and the chef’s choice of hot Thai breakfast dishes. There’s also coffee, tea, and almond milk to drink. Lunch was always a salad bar with an array of cold Thai salads, and a buffet of Thai curries, stir-frys, chef’s choice of battered and fried vegetable, French fries, and rice. Dinner was virtually the same as lunch except with a western style salad bar. Water is freely available in the dining area all day long. The climate in Thailand is hot and humid for most of the year, so you’ll definitely need to drink a lot of water when working. As the guides told us at the beginning of the week, “drink a lot, pee a lot, and you’ll be fine”. How Much Does It Cost to be a Weekly Volunteer? It costs 12,000 Thai Baht per week (currently $378 US dollars) to volunteer at Elephant Nature Park. Obviously, this is a “pay to volunteer” program, but I found the weekly cost to be completely reasonable if you think of how much you would normally spend on vacation in a week. This cost is essentially your monetary donation to the park in addition to covering your accommodation, food, guides, and use of the facilities. What Should You Pack to Volunteer at Elephant Nature Park? Is There Wifi at Elephant Nature Park? Yes. There is wifi in the main pavilion/dining area, but not in the rooms. I wouldn’t rely on the wifi for communication though. It’s very spotty and is commonly down for up to a week at a time. If you need to communicate with the outside world while you’re there I’d recommend getting a local DTAC Happy SIM Card in Chiang Mai. People who had this SIM card had a strong phone and data signal for the entirety of their stay at Elephant Nature Park. Is Elephant Nature Park Family Friendly? In general, yes, Elephant Nature Park is extremely family friendly. We saw multiple families there with young kids both doing the day and overnight visits. Kids can also volunteer, but there is an age requirement. Am I Too Old/Young to Volunteer at Elephant Nature Park? As long as you’re fit enough to participate in all the volunteer activities you are certainly not too old to volunteer here. While most of the volunteers were young backpackers, there were a few volunteers in our group that looked to be retirement age, and they all had a great time. As for being too young, you’re never too young to visit the park, but to volunteer, you must be over 12 years old and have an adult present if you’re underage. Is Volunteering at Elephant Nature Park Good for Solo Travelers/Couples/Friends? Yes! Elephant Nature Park is perfect for solo travelers. In fact, most of the volunteers that come here for the week are traveling solo. Volunteering as a solo traveler is a great way to meet tons of cool new people, many of whom will likely become friends by the end of the week. Elephant Nature Park is also popular among couples and groups of friends as well. If you are traveling with other people, your guides will make sure to put you all in the same room so you can bunk together. How to Decide Which Elephant Nature Park Program is Right for You? If you’ve taken any time to peruse the Elephant Nature Park website, you’ll know that there are about a million and one programs to choose from. If you’re looking to spend the maximum amount of time you can with elephants and don’t mind getting your hands dirty, I would highly recommend participating in either the weekly volunteer program at Elephant Nature Park or Journey To Freedom, their offsite weekly volunteer program working with elephants in the local villages. Both of these programs allow you to get up close and personal with the elephants and actively participate in elephant care as well as make friends with lots of other awesome travelers. A day or overnight visit to the park (which is their most popular program) is mostly hands-off besides feeding the elephants. If you’re short on time, this is a great way to get your elephant fix in and support Elephant Nature Park while still sticking to your schedule. 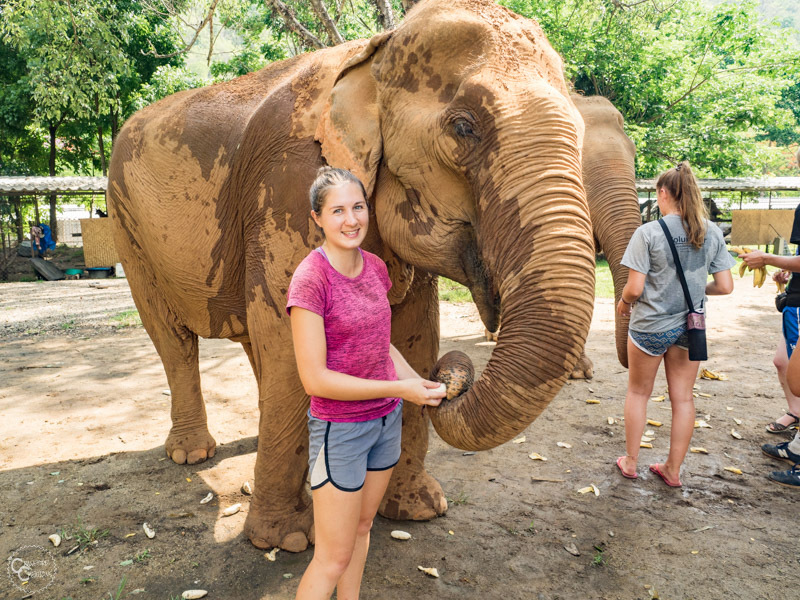 If you’ve only got a day or two and are looking for even more of a hands-on elephant experience, I’d recommend checking out some of their offsite day programs such as Elephant Highlands or Pamper A Pachyderm. 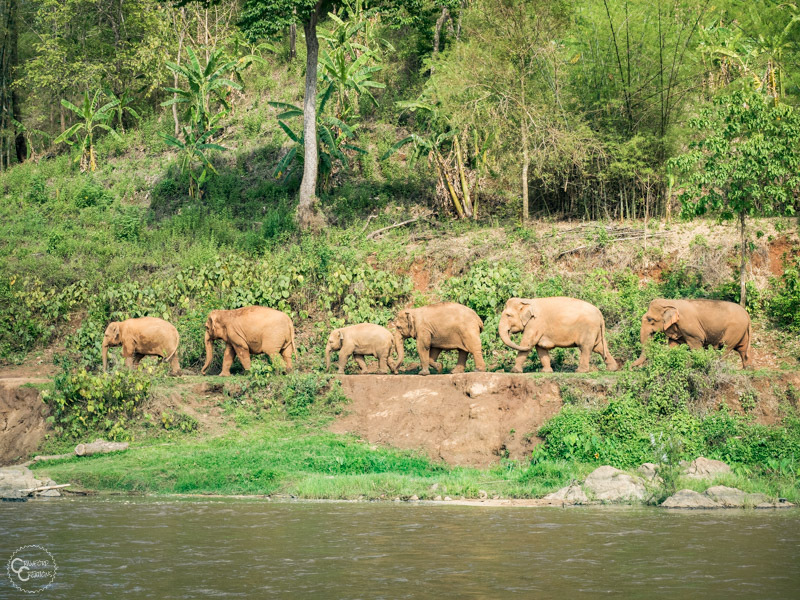 These programs allow you to walk with the elephants through the jungle and bathe elephants in the river, two activities no longer offered at Elephant Nature Park. How Much Do You Get to Interact with the Elephants When Volunteering at Elephant Nature Park? Hands-on encounters with the elephants are kept to a minimum. The only opportunity you get to be really hands-on with the elephants is when you’re feeding them, which only happens twice a week. That being said, there are lots of times when you get to be up close to the elephants. This happens when you’re cleaning the park or going on elephant walks, but in these cases, it’s a look, don’t touch scenario. Over the years Elephant Nature Park has gotten more and more hands-off in their approach to tourism. As recent as 2 years ago Elephant Nature Park was still offering river bathing and mud baths with the elephants that tourists and volunteers could participate in. They’ve since done away with that. The reason being that, while elephants do enjoy bathing in the mud and playing in the river, doing so on a schedule surrounded by hoards of tourists multiple times a day is not natural. Whenever you have too much of a good thing, it becomes like work, and as we all know Elephant Nature Park is very much against working elephants. To owners Lek and Darrick, it felt like they were still forcing the elephants to participate in tourist activities, so they made the decision to stop offering bathing. Honestly, after spending a week at the park, I would have to agree with their decision (as much as I would have loved to bathe an elephant). 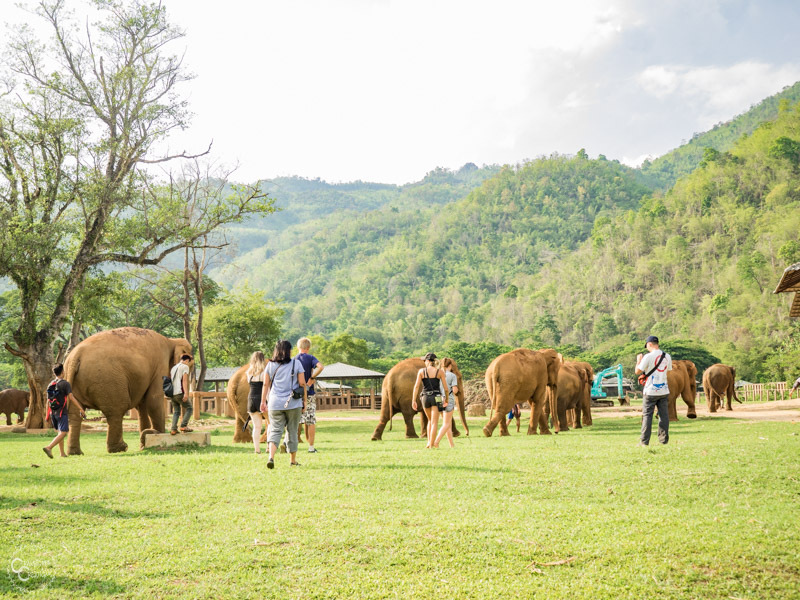 Elephant Nature Park plays host to hundreds of tourists a day. In comparison to the number of people visiting the park, their population of 30 elephants (maybe less) that are actually safe for tourists to interact with is meager to say the least. If each group of tourists got to bathe an elephant family, each family would be down at the river multiple times a day just so tourists could splash water on them. As Elephant Nature Park grew in popularity it simply got to the point where offering elephant bathing wasn’t feasible anymore. 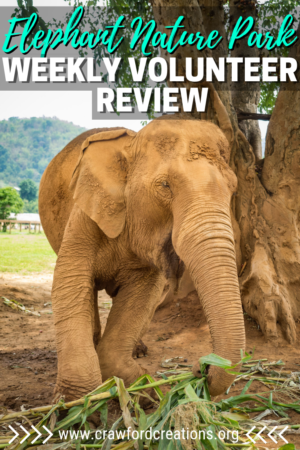 If you want a more hands-on environment to volunteer in, feel free to check out the Journey to Freedom volunteer program or their new Surin Project weekly volunteer program on the Elephant Nature Park website. Would I Recommend Volunteering/Visiting Elephant Nature Park? I seriously can not recommend volunteering or visiting Elephant Nature Park enough. It was by far the most amazing experience I’ve ever had while traveling. I would go back in a heartbeat!